Last year we started a little tradition, commissioning an illustration to give away as desktop wallpaper during the holidays. 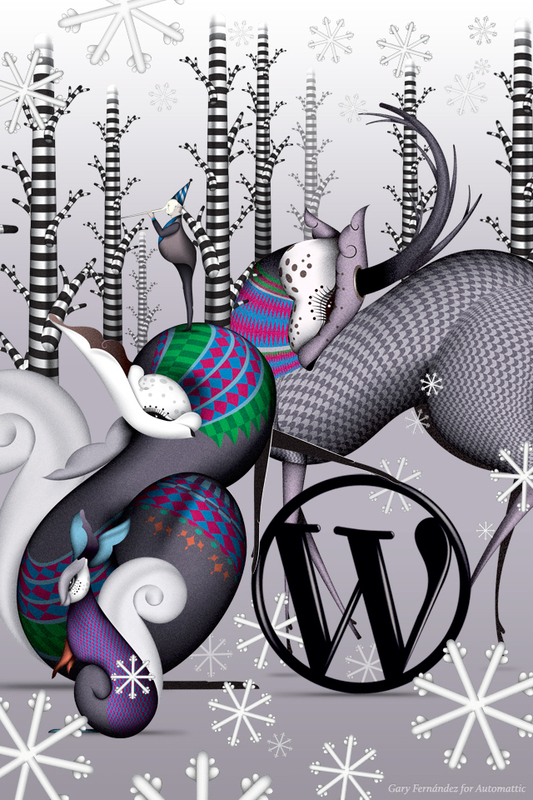 This year, Spanish artist Gary Fernández has created a wintry forest scene filled with curious characters who have great taste in blogging platforms. Friends in the southern hemisphere, we love you too, but if you haven’t already noticed, we really have a thing for snow. We hope you enjoy — and happy holidays from all of us at Automattic! A tip: Choose an image larger than your screen size, and set the position to “center” or “fill screen” (not “stretch”). For smartphones and tablets, we recommend only using the background image on your lock screen, so it doesn’t interfere with your icons. Need help changing your wallpaper? Here’s instructions for Ubuntu, Mac OS X, and Windows. If you were a fan of last year’s illustration, you can find it in this post. I love the illustration! Thanks so much, WordPress! This is Excellent wallpaper !! 4 of my blogger friends has save this instantly. Thank you so much hard working staff of the WordPress platform. It’s really COOL!!! You spoil us with so many apps. Looking forward to applying it . Merry Christmas every1 🙂 Great wall. 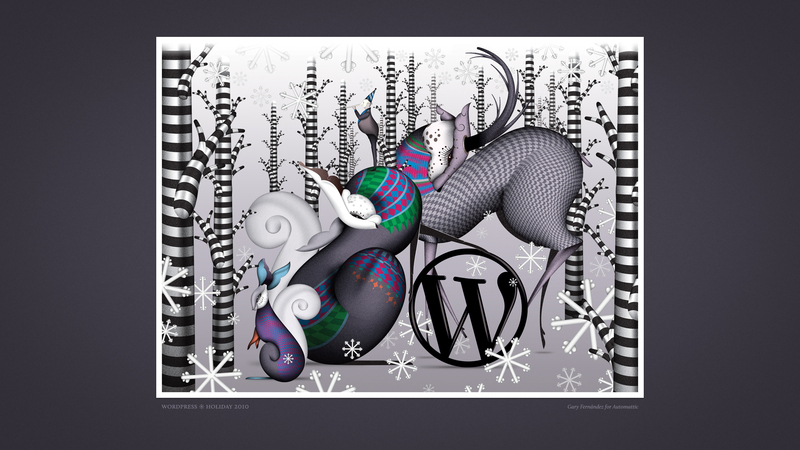 For you, WordPress Team, Merry Christmas! Very Interesting and imaginative. Merry Christmas. Wow! That’s really cool. I love the trees 🙂 Thank you! Gorgeous! Thanks for continuing the tradition. This wallpaper is incredibly beautiful… and now takes pride of place on my Macbook. That’s super cool. Thanks and have a great Christmas. honestly, I’m sticking with a cute picture of my adorable son for my wall paper but I will be featuring the image in a holiday blog post soon! That’s amazing, I’ve never seen anything quite like it! A refreshing abstract touch as well, my compliments to the artist. Wow, thank you! It’s gorgeous!!! The grey background on the desktop image was a little somber for me. I’ve been sporting this image with a violet background for a few weeks and the violet really brings out the colors and details. I’d love to hear how you made this beautify art your own either in a small way (like me) or by creating something new. Absolutely beautiful!! Thanks for sharing it with us! I love beautiful, thoughtful presents. Thanks. Wow! This is a terrific piece of art work. Thanks for sharing it with us. You people are always thinking of ways to make our blogging easier, and nicer. Merry Christmas to all. Well, this is simply awesome. Surprised! Yes I am a very Senior Citizen…. Interesting piece of art! Thanks a lot! A little sick and scary. Love it. Nice work. Love the silver. love the illistration. It is beautiful and tranquil. I will be using it. I really like the details in the picture. Very nice. The silver, black trees are really neat looking. I like the little guy standing on the animal’s nose too. Wow, this is a lovely picture! Thank you for it, WordPress! Merry xmas!! Great work, thanks. great one, thanks from Germany! Very lovely wall paper, Thank you from Finland. Though that piece of art doesn’t particularly strike me, that’s OK. I still wish you a blessed Christmas time. Thank you very much for WordPress!! Memes, themes, and great color schemes help my tomes tickle funny bones! You make working with WordPress so much fun! You folks give us wonderful support all year round. Thank you! Absolutely beautiful! Thank you very much! Wow…..OK….Somebody’s been smoking the ivy…or is it mistletoe…or are we just trying to be weirder than Tim Burton at Christmas time? With that said very interesting and well crafted piece of art. A beautiful wallpaper, the falling snow in the background is creative. A Bold surrealistic Beautiful Reflection of Christmas fauna and cheer All Over the Universe…Happy Holidays ! Love it!!!! Happy Hoidays! WP Rocks! That is super cool 🙂 Like it a lot ! Ferreting out last year’s illustration ( I was not a WordPresser last year) I was amazed by the pleasing harmony of its colours and I thought to myself how wisely you anticipate the bloggers’ needs and desires according to their tastes. I really enjoyed the “Christmas” wallpaper. Thanks. I’m alreadey using it, thanks! Very cool! I love it!! Merry Christmas and Happy New Year Everyone! 🙂 That will go nicely on my laptop. Cheers! Amazing! Loving the trippy feel of it. Happy hols, all! Great creativity. I must say it looks very exceptional what an art. wow….i like this pic so much…… thanks !! this is actually a pretty tight background. hehe. sweet. This is a lovely images, thank for the thought now and all through the year. I really appreciate the wonderful service I receive here at WordPress. Pingback: Andrew's Math Site » Blog Archive » A first look at LaTeX in Wordpress.